I replaced my struts and shocks over the weekend. I hadn't done this on an E before, and there is a little learning curve. If you decide to do this yourself, hopefully this post will speed things up for you. There are three parts because I can only post 4 pictures per post, so please bear with that. Also, a long time ago, I used to occasionally edit technical manuals as part of my job. I always wanted to make them something less than bone dry to read, so now you've got to put up with my attempts at humor. My E is a 2008 with appx 63,000 miles on it. The right front strut failed. At the same time it also needs new tires, the other car needs new brakes, and my wife decided she wanted a new refrigerator. Something had to give. While I was at it, I decided to do the rear shocks. 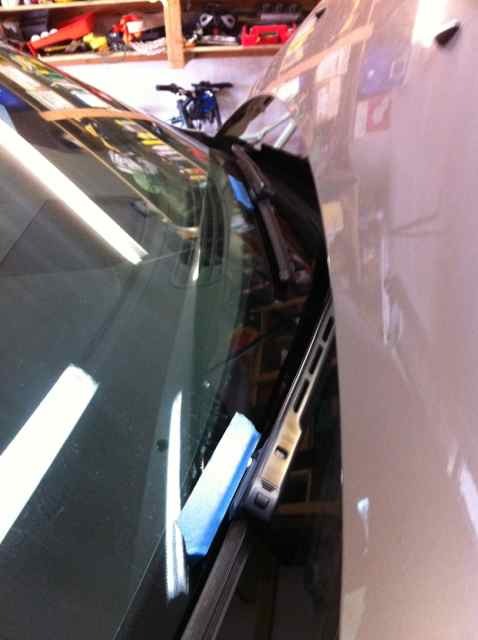 To replace the struts on an E, you must first remove the windshield wiper arms. No, I am not kidding. First, gently pry off the little black plastic cover at the base of the arm, and take off the nut. 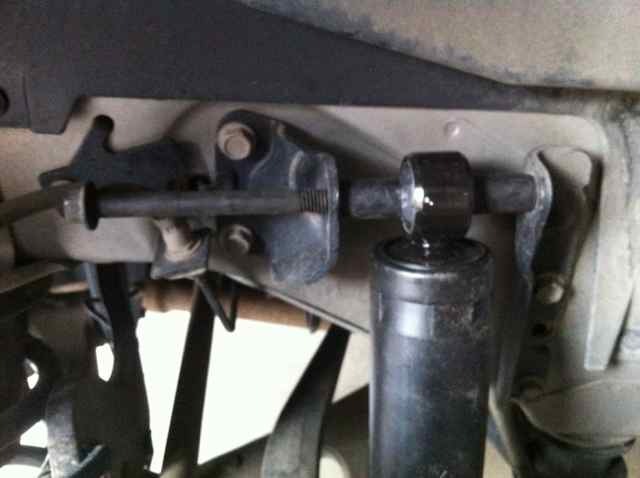 To remove the arm, a wiper arm puller, or a small gear puller, is HIGHLY recommended. You can't get any leverage on the arm, because it sits just under the edge of the hood when the hood is open. The lower edge of the windshield runs under a plastic valance, and you can't pry off of that side of the arm or you'll risk cracking the windshield. Every where else the valance sags when you pry against it. Before you remove the arms, cycle them so they come to rest in their normal spot. Put some masking tape above each wiper blade. When you pull the arms, the whole mechanism will probably move a bit. So when you go to replace the arms, cycle the wipers again, and the mechanism will end up in the right spot for reinstalling the wipers. The next step is to remove the air inlet grill/valance. It runs from the bottom of one A pillar to the bottom of the other. There is a soft rubber portion to it that runs slightly up each A pillar. Gently wiggle each end free. There are also four black plastic button fasteners on the forward edge of the valance. Remove these. Remove the auxiliary battery ground post. 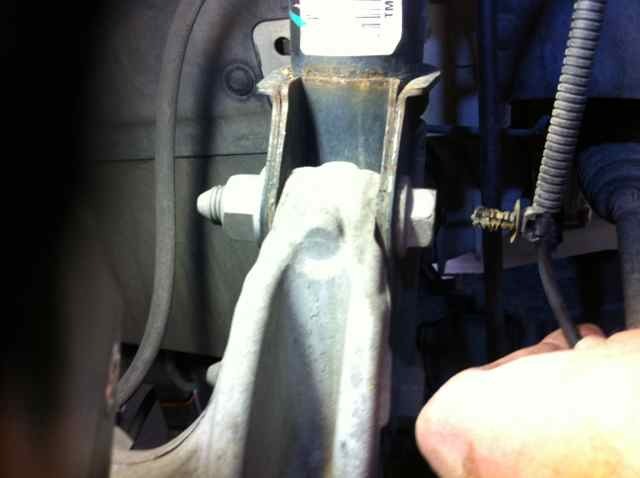 Once all the fasteners are out, yank the valance forward about an inch. It should now be free. When you pull it out, you will notice about 7 white plastic fasteners that were hidden under the back edge of the valance. The fasteners are now either in the valance or in the crossmember supporting the valance. It's much easier to reinstall the valance if you put all the white fasteners back in their appropriate spot in the valance. Once the valance is off, you can see the strut tops. 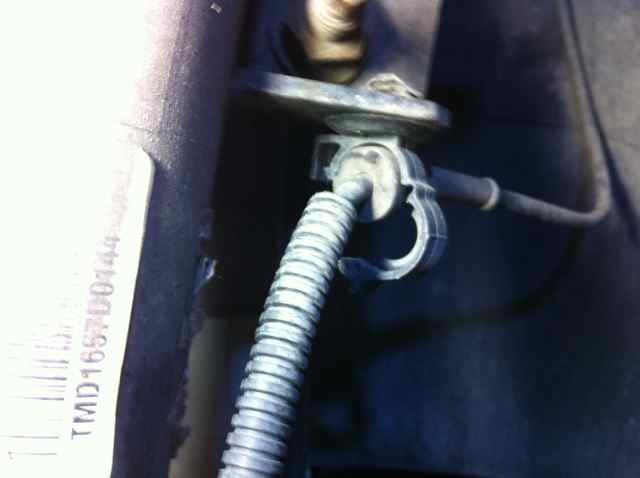 Once the wheels are off, the first thing to do is to free the speed sensor cable from the side of the strut. The upper cable clamp pries open easily. The lower cable clamp needs to be gently yanked out of the strut. After the cable is free, remove the upper cable mount. Save them, because you'll reuse them. Once the speed sensor cable is free, the next step is to remove the upper end of the sway bar link from the strut. To do this I used an impact wrench to break the 18mm nut free. (in revenge for moving to metric, GM used some 18 and 22mm nuts. A lot of socket sets skip those in favor of odd numbers like 17,19,21 etc.) It's hard to see in the photo, but the end of the stud is cut into a 8 mm hex. I anchored the nut with a wrench, and used a socket on the 8mm stud to spin it out of the nut. 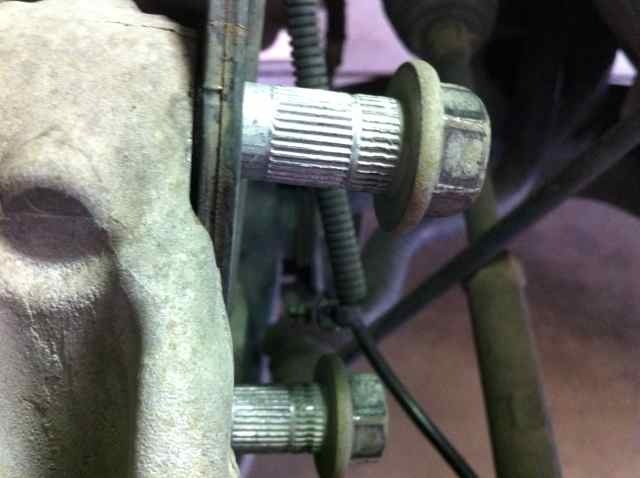 Unlike some sway bar links, the flange on the stud is not machined with flat spots for a wrench. So your choice is either the way I did it, or clamp a vice grip on the stud and turn the nut off. The ball joints in the links were in good shape. Before you loosen the strut to knuckle nuts, my trusty service manual suggested scribing a mark along side the strut where it meets the steering knuckle. You might think this is so you can get the car in close alignment when you reinstall the new strut. You would be wrong. The reason you put the marks there is so you can see just how far out of alignment you really are when you put the new struts on. Once you put the new strut on the knuckle, you won't be able to budge it. If you look closely, you can see my shiny scribe line. Now loosen the large nuts (24mm). This wasn't that hard to do. 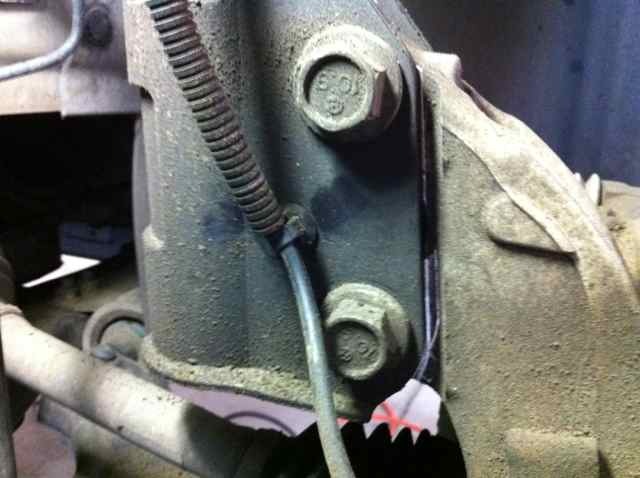 After you remove them, place a floor jack under the brake disc to support it. Then take a big hammer and pound the bolts out. You'll see in another picture that they are grooved on the portion of the shaft that's in the the knuckle. So they need to come straight out. Next up are the three 15mm strut tower bolts on top of the fender. In their infinite wisdom, the people at GM decided to make one of three studs longer than the others. I supposed this facilitated assembly, but it means you need a deep socket to get that nut off. I ended up using a 5/8 spark plug socket. The three nuts are easy enough to get at, but be careful not to drop them, or they will go down into never never fenderland, destined to rattle till the car is crushed. And your wife won't like you stealing the nut off of her E because yours really needs it more. 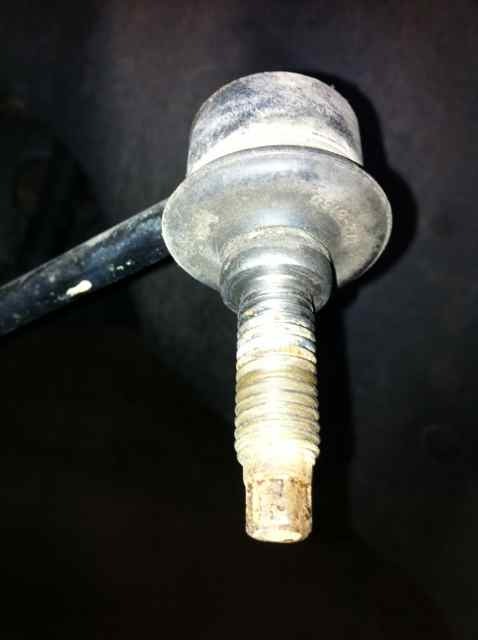 The following pictures show the sway bar link stud; scribe marks on the knuckle; strut bolts; and the strut mounted in the fender. Once you've got the strut out, simply compress the spring and put it on the new strut. Before you do this, keep in mind that an Enclave weighs almost 5,000 pounds, so you need about 1250 lbs of force to compress the spring. The springs on a Enclave are fairly large in diameter, and have a good size gap between each coil, so they are actually fairly easy to compress because you can get the compressor on them easily. However, the actual wire that the spring is wound with is also fairly large in diameter, so some spring compressors might not fit on it. Mine did, but just barely. Make sure you use a high quality compressor. Some people also put a nylon strap with a ratchet around the spring (2 per spring) as a safety before loosening the 22 mm nut that holds everything together. For some reason, the fenders in the E have four holes for three studs. So you could potentially put the strut in wrong. Another new invention by GM. Fortunately, the strut plate is not symmetrical. The curved side faces out, and the flat side faces the engine. This will align the studs correctly when they go through the fender. If you haven't done this before, a hopefully helpful hint is to put the strut on the knuckle, put one or both bolts through loosely, and then use the jack to slowly lift the strut up while you align the studs with the holes in the fender. The rear shocks are pretty straight forward, except that it would be nice to have deep socket for the 18 mm nut on the upper mount. Also, remember to use the floor jack to support the rear hub. 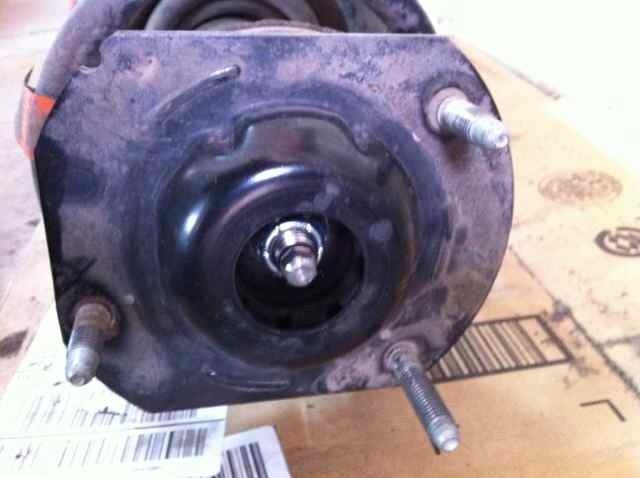 When removing the upper bolt, it's helpful to lift the hub up, as this moves the brake line to a better spot. It is possible to do the front struts in about 4 hours. I lost some time on the wiper arms, because I had to go buy a puller in the middle of the project. 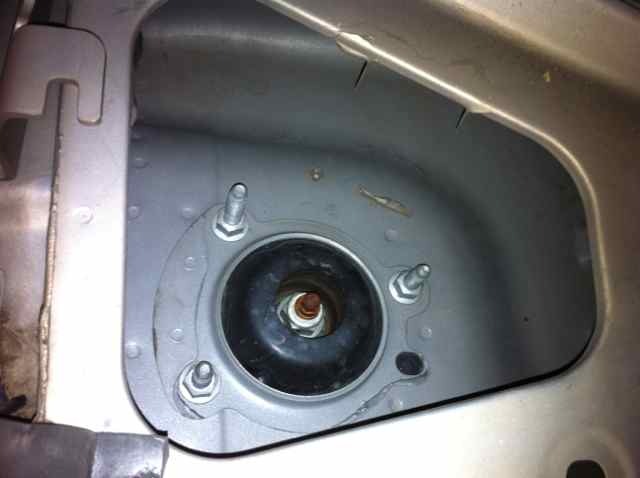 It also took me a while to realize that the main strut mounting bolts simply need to be knocked straight out. They are in so tight that I thought they might be threaded, but of course they are not. I got the struts and shocks from Amazon.com. They are Delco parts. The struts were $78, and the shocks were less (can't remember right now.) I looked everywhere and couldn't find quick struts (struts that already have the spring installed.) I contemplated replacing the strut bearing and or mount plate, but I'm glad I didn't as these seemed to be in good shape. The pictures show the strut mounting plate with one long stud, and the rear upper shock mount. Hmm. Sounds like a job and a half. Good write up, however. 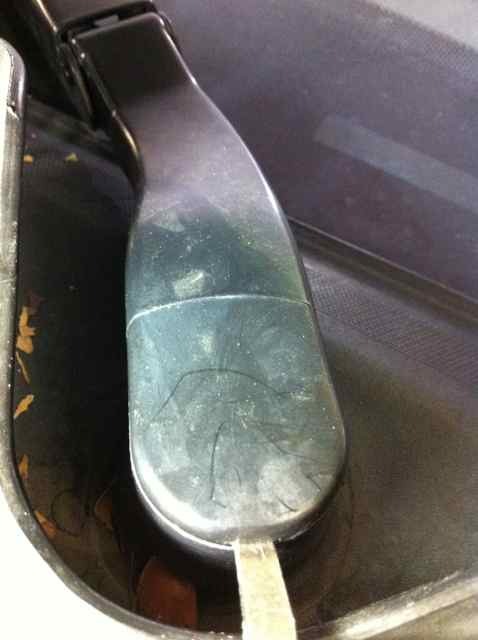 The wiper removal was a shock! It really isnt that bad if you have the tools. The Rears took me about an hour total. The first front strut took me over an hour. The second however took me 45 min. Nice job! I'm a tech writer myself (patent attorney, hence my name for anybody curious: Title 35 Esquire) so I appreciate the attempts at humor. I'm sure a mod will merge these three threads into one so everything is in the same place for future reference. Done. Parts A, B, and C have been merged for easier review. Thank you! I certainly didn't see the need for three threads! I would have liked to have done it in one thread, but you can only post 4 pictures per post. That can be circumvented by replying to your own post to continue adding text and photos. This is how the merged threads turned out anyway, so there is no harm done. It gave me an excuse to perform a little housekeeping on the forum, anyway.